A volume snapshot is a copy of a storage volume (root disk or data disk), captured at a point in time. Volume snapshots can be taken manually, see How to take a snapshot of a volume, or automatically at scheduled intervals, as described here. Volume snapshots are not guaranteed to be application-consistent. There are no guarantees you will be able to recover all of the data that was in the original disk. 'Open file' applications such as databases are likely to have incomplete or corrupt data in a snapshot. Each volume snapshot consumes an amount of space equal to the original volume size. Because of this, volume snapshots are not a cost effective way of storing multiple backups of a volume. The most efficient approach is to use recurring snapshots, for which only the most recent (one or two) snapshots are retained, and set the snapshot frequency to daily or hourly as required. 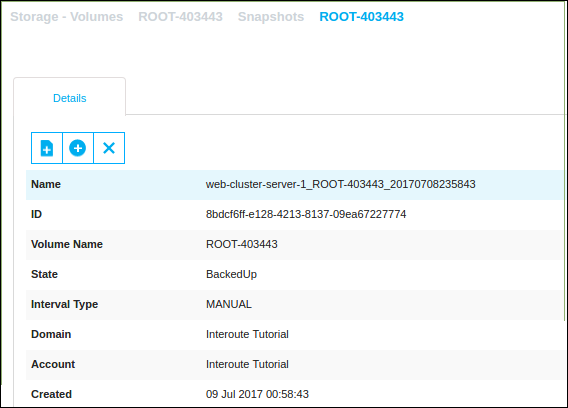 To make use of the data in a snapshot, you can convert it to a volume, and attach the volume to a VM in order to access the stored data. A snapshot can also be converted to a template, which can be used to create VMs. Choose Hourly, Daily, Weekly or Monthly, and set the required time and day for each snapshot, with reference to the selected timezone. In the Keep input you must enter the number of snapshots that will be kept: '1' means keep the most current and delete all previous, '2' means keep the current and one previous, and so on. Click Add. The new recurring snapshot will be listed at the bottom of the dialog (under the heading Scheduled Snapshots) along with any existing schedules for this volume. Click the Delete button to delete any of the existing schedules. Note: this does not affect any snapshots already taken and existing, only snapshots in the future. Click the name of a volume. Click the View Snapshots button in the Details sub-panel: . Alternatively, you can see a list of all the snapshots in your VDC account by clicking Storage in the left-hand menu, then use the Select view drop-down list to select Snapshots. 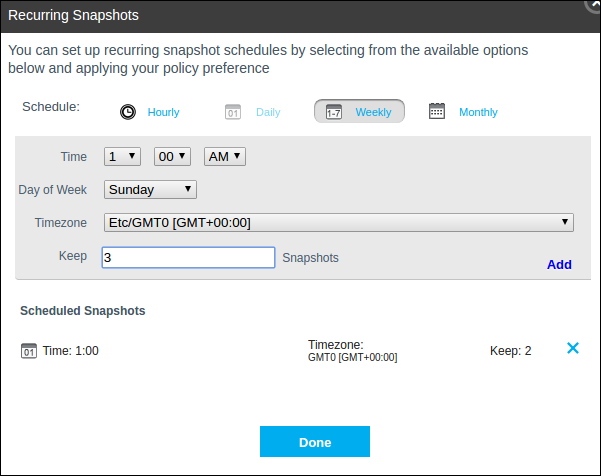 The snapshot list contains automatic and manual snapshots, which is indicated by the 'Interval Type' (MANUAL, HOURLY, DAILY, WEEKLY, MONTHLY). A new snapshot will appear in the list of snapshots with the state ‘BackingUp’, otherwise a successful state will be ‘BackedUp’, with a green indicator dot. Create a template: Templates that you create will appear in the 'Mine' category of the Templates panel, and in the 'My Templates' category when you deploy a new virtual machine. Create a volume: The volume that you create will appear in the list of volumes in the Storage panel and the contents of the volume can be accessed by using Attach Disk to attach the volume to a VM. Delete the snapshot: Note that deleted volume snapshots cannot be recovered.